So, my Mom doesn’t cook. She actually hates to cook. That and loving to sleep are the only two things anyone can peg against her. However, looking back on my childhood I remember pumpkin soups (Puerto Rican style soup that her mother-in-law taught her), spinach, fruit, egg salad, liverwurst, sprouts and her famous tuna salad recipe. At my Elementary School’s cafeteria there was an over abundance of Doritos, Snickers, pizza, french fries and Fruit Roll-ups. Oh my god, Fruit Roll-Ups were my favorite (whenever I got my hands on one, which was rare). Remember wrapping them around your index finger and just sucking the sweetness off? I was the kid that no one ever wanted to trade their lunch with. Why? Because my lunchbox was 100% organic with no sugar added. 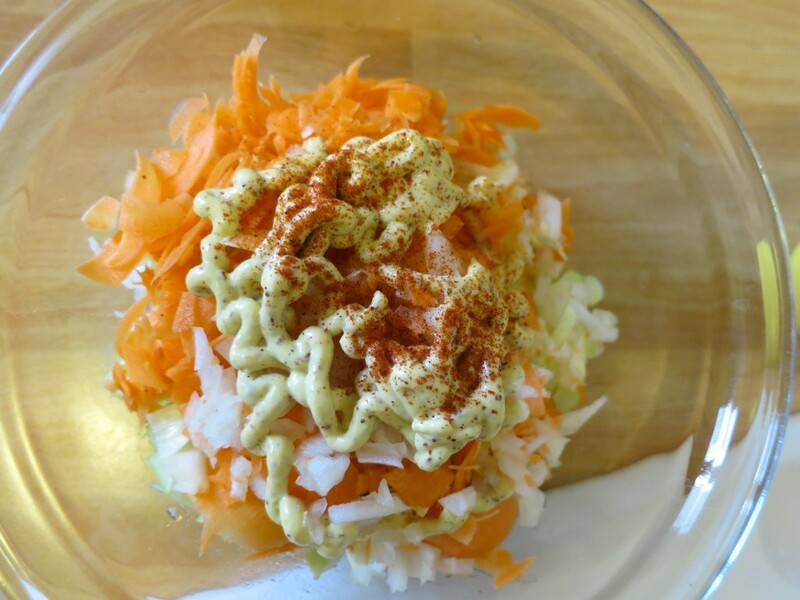 It had a cut-up apple, carrot sticks and a sandwich… oh! and a love note written on a yellow Post-It every day, never failed. My typical sandwich began like this: whole wheat bread (but the wholest of the whole and the wheatiest of the wheat), a happy portion of mustard, a sad amount of mayo, about 2 inches worth of sprouts, then it was a toss between the above mentioned sandwich friendly fillings: egg salad, liverwurst or tuna salad. Oh, and on a good day I would get peanut butter and jelly, I think. That was how I ate for a few good years, until I figured out that if I brought a dollar with me to school my palette would open up to a whole new world of alphabet french fries, mac & cheese and other useless items such as these. So, who cares what I ate as a kid, right? 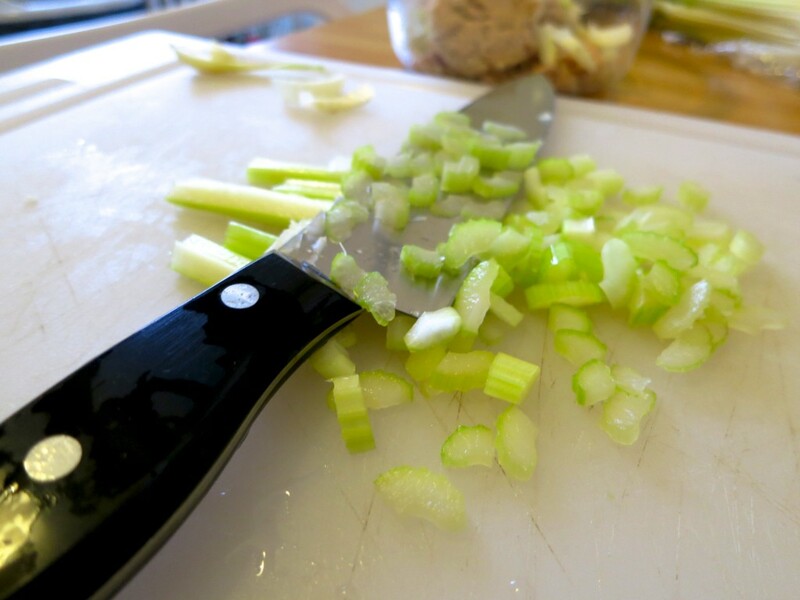 Well, the other day I was making tuna salad, which I hadn’t made in years, and a smile came to my face as all the above memories came flooding in. I made the tuna salad thinking of how much my Mom probably put so much love into it, and the time she took to draw a heart or write a note on the Post-It to top it all off every day. My Mom taught me many important life lessons and I owe her more than I care to admit (there, I said it), but it also comes down to a damn simple tuna salad. Learning to eat right and feeling cared for are probably the biggest gifts you can give a child and my Mom did both of those for me. She’s a big ‘ol tuna salad with never ending amounts of Post-It notes and sliced sweet apples that nurtured me and helped me grow. 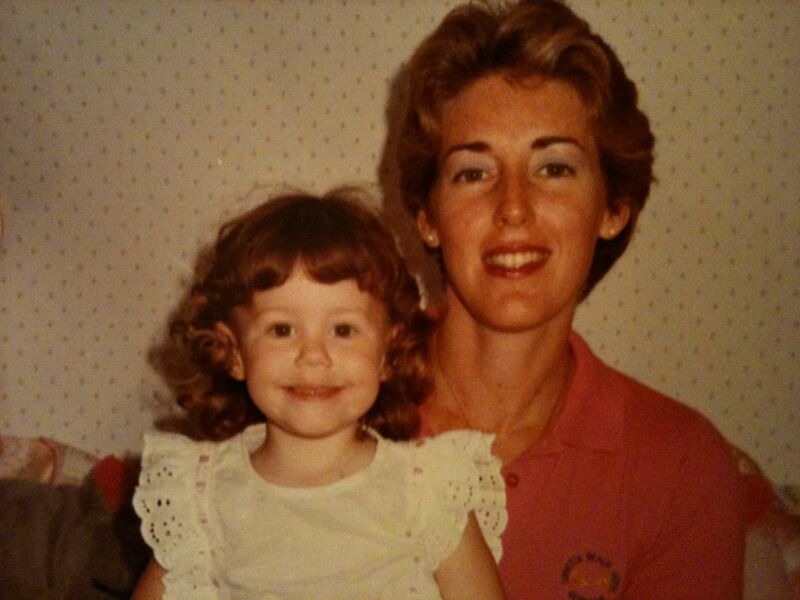 So, thanks Mom, for all the sandwiches you made me, soccer games you went to, trips you took me on and all the lessons you taught me knowingly or not. 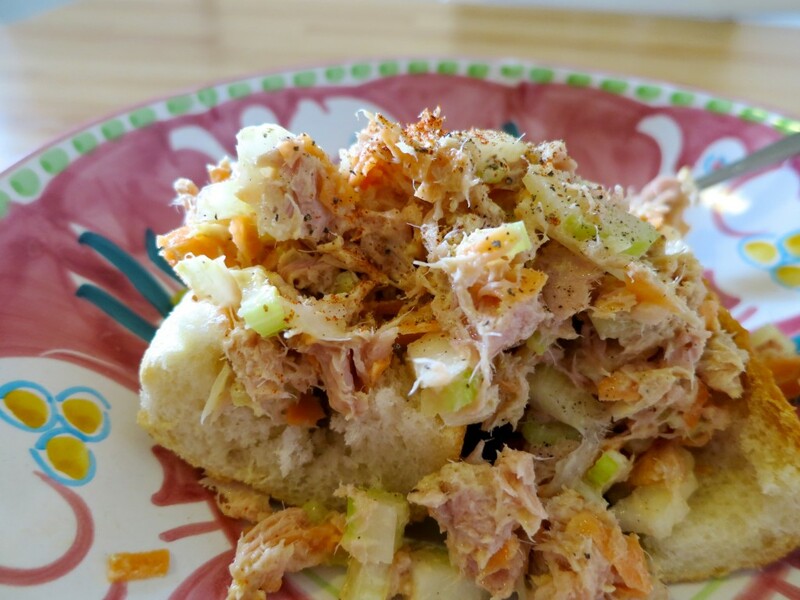 This is my twist on my Mom’s tuna salad recipe. It’s spiced up a bit. It’s always best to make a lot so you can make 3-4 sandwiches for the week… or to just eat with a spoon when you want to veg out. 2-3 tablespoons of mustard, which ever type you prefer. I like a spicy horseradish type or ones with mustard seeds. My Mom always used French’s. I think we all know how to make a sandwich, right? So, chop all the veggies up and toss them in with everything else. 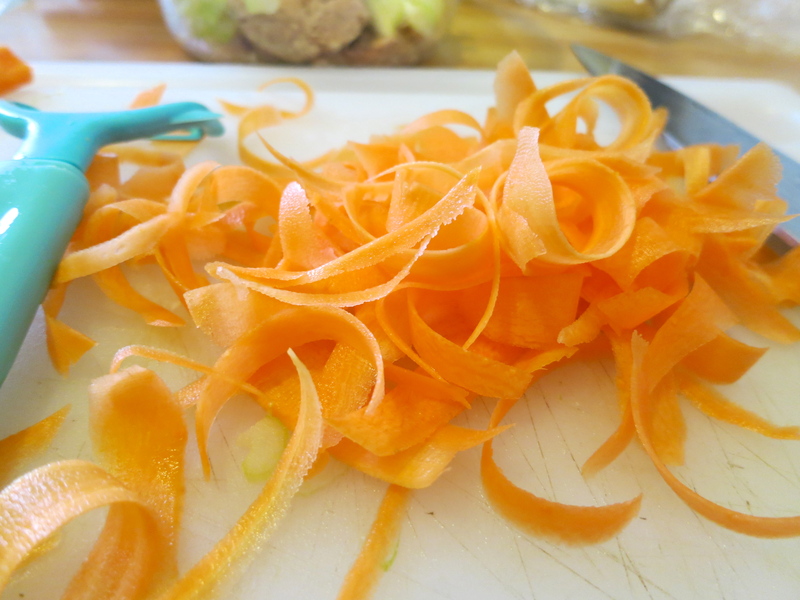 I like to use a peeler on the carrots first, then chop it up, so it’s nice and thin. Mom’s are great, but there is nothing like a Great Mom. What is your most nostalgic dish? Thanks Auntie, Karijos would be something else, huh? lol. Ya, I started thinking about all the lunches I ate as a kid when I made my own tuna salad, funny what pops in our head. Love you! What work! I’ll stick to the dollar bill with the mac and cheese…and of course the yellow post-it. Looks delish! I also like adding a little lemon juice to mine. Ah, never tried that before. I love squeezing lemon on most things, I’ll try it next time!